When we think of ancient Egypt, the god who leaps to mind is the sun-god Ra, but the Egyptians were also well-provided with moon-gods, including Thoth, Khonsu, and Aah. The Lower Egypt version of Khonsu had the lion-goddess Sekhmet for a mother, so perhaps his reputation for violence was inherited. In the papyrus of Nu he devoured the hearts of the deceased, and some Books of the Dead call him Slaughterer of the Lords. He also was called the Destroyer of Evil Spirits, so like his mother he took on a protective function, especially against disease. The Bentresh Stela records a cure worked by Khonsu on a foreign princess. 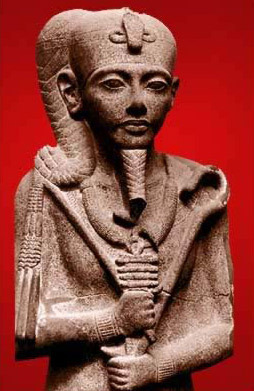 Khonsu-at-Thebes was mainly depicted as a youth, with the side-lock that children wore. 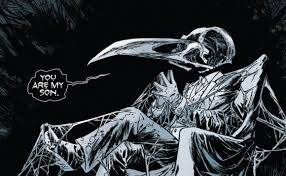 Oddly, he wears a mummy’s wrappings, with his hands unbound so he can hold the crook and sceptre. Like most Egyptian deities, he was part of a triad, with Amun and Mut as his parents. In the New Year’s festival at Thebes his statue was brought in his sacred boat to rejoin those of his parents. Khonsu was also associated with the air-god Shu, as divine child, and at the temple at Kom-ombo (Nubt) he changed his parentage to that of Sobek the crocodile god and Hathor the sky-goddess. In Lower Egypt, his parents were the lion-headed Sekhmet and the creator-god Ptah. Hawk-headed version of Khonsu, with moon instead of Horus’ sun. Although many of us now associate the moon with illusion and uncertainty (see the Tarot, among others), the ancient Egyptians appreciated its regularity, and had a lunar-based calendar, with some modifications, which is why the calendar myth involves two lunar deities, and Thoth was the god of mathematics and writing as well as time and the moon. While Khonsu may seem paradoxical – both divine child and devourer of hearts, it must be remembered that Egyptian deities evolved over a very long time, and had many aspects. Also, his sometime mother Sekhmet had a similarly split personality, since the lion-headed goddess was literally an embodiment of the anger of Hathor, the sun-goddess whose form was a cow. Sekhmet nearly destroyed humanity, but beer saved the day. She and Khonsu both had protective functions, which licensed their ferocity. You can see how he might be an inspiration for a superhero who fights the darkness, and wears the moonlight as his armour. Barrett, Clive 1992: The Egyptian Gods and Goddesses: the Mythology and Beliefs of Ancient Egypt, Aquarian Press, London. Hart, George 1996: A Dictionary of Egyptian Gods and Goddesses, Routledge, London. The image at the top comes from Flickriver, by Elsie esq. This entry was posted in Egyptian, Mythology and tagged Horus, Khonsu, moon, time-keeping on January 27, 2015 by solsdottir.